Well… it’s taken it’s sweet time, but I think I’m finally there. Where, I hear you ask? Where is there? There, just so happens to be a point at which my imaging has finally become routine. At long last, I have a setup that, for the most part, just works. There were a final couple of things that took me from a simply usable non-permanent setup, to a very usable setup. Yes, the third one is supposed to be in caps, mostly due to it’s status as some form of wonderful black magic, which has made the whole thing just so much more bearable, but more on that in a bit. All of that is connected (in this shot) to the 2″ focuser of an f/7 Altair Starwave 120ED Refractor. Firstly, the OAG. This has been a revelation. For those who don’t know, OAG stands for ‘Off-Axis Guider’, and is a device that sits between the scope and the filter wheel, using a small ‘pick-prism’ in the edge of the field of view to grab some stars for guiding purposes. This bit of the light cone doesn’t fall on the chip, so it doesn’t interfere with your image at all. OAG has the advantage that you’re guiding at the same focal length as you are imaging, and also you’re getting rid of any chance of movement due to flexure in the whole setup. I’ve struggled with a side-by-side finder-guider setup for the last few years. This has worked reasonably well on the ED70 and 102ED, but proved to be completely useless on the 8″ LX90 ACF. Even on the refractors, it could be a little fussy, as well as taking quite a while to set up each time. Switching to OAG wasn’t the least painful process I’ve ever undertaken. 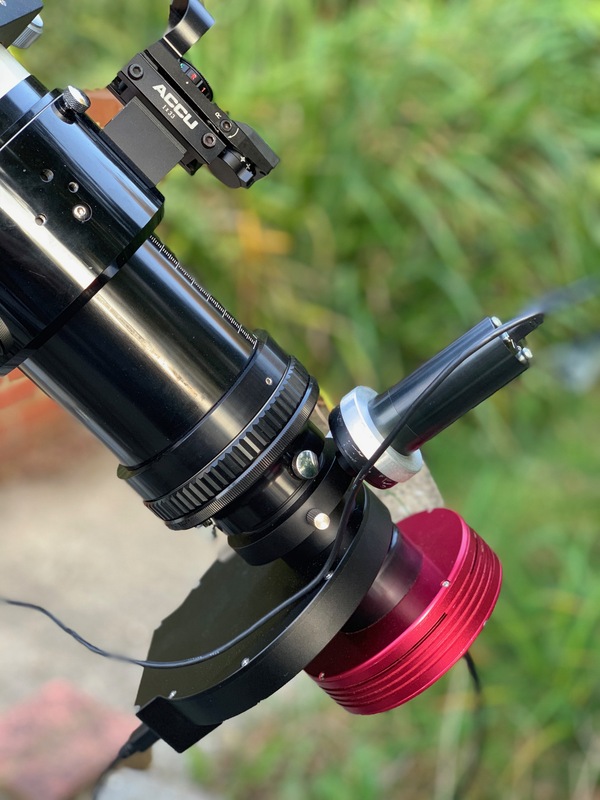 The process of getting it setup to be parfocal with the main scope was absolutely HORRIBLE – I suggest a distant object in the day to do this after struggling for about three nights with no luck whatsoever… However, once it was sorted, I haven’t had to touch it since, and it JUST WORKS! Secondly, the filter wheel. This is a simple case of absolute convenience and speed of setup. Having a USB filter wheel I can connect to APT during imaging, and simply switch within the imaging software is wonderful. It also serves as a place to store the filters between sessions rather than having to box them all up again. 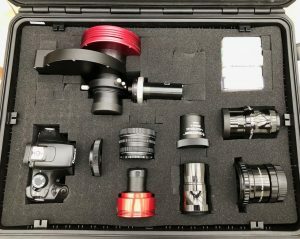 The whole setup – Camera, filter wheel, OAG, is fronted by a simple 2″ nosepiece, which can be used in all three of my imaging scopes. The whole lot comes off for storage in one piece, and fits in my imaging kit case (after a bit of reshuffling of the foamy bits – spray adhesive is your friend here 😉 ) along with some of my other bits and bobs. Finally, the icing on the cake – PLATE SOLVING! 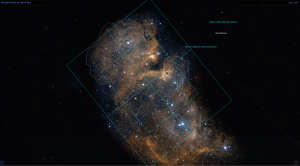 Plate solving is the process of taking an image of the sky, and using a piece of software to compare that image against a large database of star positions, in order to figure out the coordinates of the centre of the image. APT has built-in plate-solving, via integration with two free plate solvers – ‘All-Sky Plate Solver’, and ‘PlateSolve2’. The former is used for ‘Blind’ solving (where you start with very little idea of where the scope is pointing – useful for initial GoTo alignment). The latter is used for ‘Near Solving’, where you already know the approximate scope position. This is faster, but it needs to know approximate coordinates, and is useful for fine-tuning the scope position and/or re-syncing. This is useful in at least three ways. Firstly, it enables GoTo alignment of the mount via EQMod with absolutely no requirement to find and centre a star – you simply slew anywhere away from the pole (preferably near to the object you’re looking at imaging, but this isn’t essential), take an image (5-10 secs will do), solve it, then take the solved coordinates and use them to sync EQMod to the position of the scope. You can then slew to another location in the sky, and it will usually be at least on the chip. If not, you simply solve again and sync, then do the final GoTo. Secondly, there’s a function in APT called GoTo++, which slews to an object (or coordinates), shoots a quick image, solves, then corrects the positioning of the scope to make sure its exactly where it should be. It does this several times if needed until it’s where it should be – effectively, GoTo with verification and correction built in. A function in APT also allows for re-centring on any part of the current field of view using the same function. All of this, combines with SkySafari for showing live scope position, allows for really precise framing. The image to the right shows the view in SkySafari when framing part of the Soul Nebula. AS you can see, you can set up SkySafari to display the field of view of your imaging chip in various setups. This shot shows the field of view with my f/7 102ED as well as the f/6 ED70. My third main use for it is for re-framing an object or view that I had previously to get further data on the same object. To do this, you can pull up a sub from a previous night, solve it, then APR can use GoTo++ to centre the frame very close to where it was. Any slight deviation can be corrected in the normal way with gamepad/arrow keys etc. All of these plate solving shenanigans add up to a huge saving in time when aligning and framing objects, and means, once focused, you can retire to the warmer bolt-hole of indoors, and use something like VNC or TeamViewer to remote control the imaging PC. Lovely :). The ease of setup and breakdown has also now made me more likely to leave the rig capturing overnight. This is something I’ve never done before, but has meant that I’ve managed to capture much more data than I ever have before, making a huge difference to the quality of the final result. I simply calculate the length of time until end of astronomical twilight, or until the object goes out of view, and set EQMod to park the scope after that amount of time. It’s then all sat there in the morning, patiently waiting for me to replace the lens cap and bring the laptop in. The only risk with this is the obvious chance of a rain shower. However, it’s a calculated risk, and when the forecast shows clear all night, the chances are of course low. Fingers crossed I’ll never misjudge this one! Total setup time is now down to about 10-15 mins, with breakdown time being about the same. Alignment literally takes around a minute to complete now, and I can be in the correct area of sky and taking test images within about 5 minutes. Combine with this the fact I now don’t need to be peering up through a red-dot finder to align (which in a mobile setup like mine is often not aligned properly with the main scope…! ), and the whole process is so much more enjoyable. This is going to be my first of several posts over the next few days, as I’ve actually been fairly prolific with my imaging over the last month or so, and have a good selection of the first fruits of the labours of this setup to post, so watch this space!